Tengchong County lies at the western foot of Gaoligong Mountains, in the western part of Yunnan Province. Tengchong has a stunning volcanic landscape that includes natural volcanoes, hot springs, and volcanic lakes. Tengchong County is a quiet place, but in the last 500 years the area has registered over 70 earthquakes measuring at least five on the Richter scale. As an active geothermal area, Tengchong is second only to Yangbajing in Tibet. The county itself lies on the lava lands of Leifeng Mountain. More than 80 steam springs, hot springs and heat springs have been found in Tengchong. The geothermal heat creates different landscapes: carbonic acid and sulfur springs that boast luxuriant vegetation; sulfuric acid springs where no grass will grow; even poisonous carbon dioxide and hydrogen sulfide-rich springs. 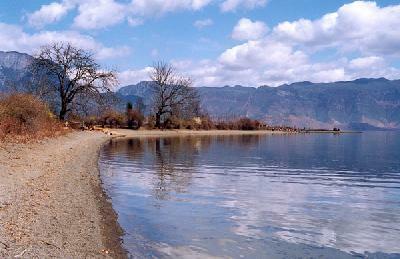 A casual stroll around the small volcanoes, followed by a dip in a hot spring will give you a good taste for the area. In Tengchong there is a saying: "Nine out of ten mountains have no head." With 97 volcanoes in the area, this is no exaggeration. In the volcano park, there are eight well-preserved volcanoes from the Cenozoic era. The foremost is Daying (Beat Hawk) Mountain, which sits in the middle part of the county and has erupted many times. At 2,614 meters, it is the tallest conical volcano in the area. Over 70 smaller volcanoes of different sizes surround Beat Hawk Mountain. About 10 kilometers to the north stands Dakong (Senior Empty) Mountain, Xiaokong (Junior Empty) Mountain and Heikong (Black Empty) Mountain. As its name implies, Dakong Mountain has been dormant for several centuries and possesses a hollow center, but the rim offer magnificent views of the surrounding landscape. The environment in Tengchong includes many different types of volcanoes as well as volcanic lakes, crater lakes and lava cascades. Taken together, these comprise the biggest natural living museum of dormant volcanoes in China. Activities: Visitors can take a hot-air balloon from the foot of the volcano. Cost: 100 yuan. Transportation: Take bus route C (10 yuan) or hire a taxi (around 40 yuan). Visitors should not miss a trip to Rehai (Hot Sea). The main attraction there is called Dagunguo (Big Boiling Bowl), a large spring that reaches a temperature of 97Ã¯Â¿Â½Ã¯Â¿Â½. Locals offer visitors eggs cooked in the spring's heat. Mineral-rich hot water is ejected intermittently into the nearby streams with a thunderous roar. Among the numerous small[take out "er" springs and geysers, the park also has cool springs suitable for a swim, including Frog Mouth, Lion Head, Pearl Spring and Drum-beat Spring. The waterfall on the Zaotang River is also an attraction. 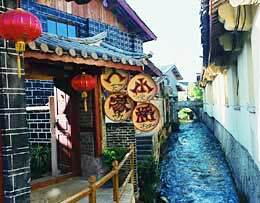 Overall, Tengchong has more than 80 hot springs with nearly every village having one of its own. Transportation: Take the county bus or a taxi. (both cost 5 yuan per person). A bicycle can be rented, but it is a difficult path, both winding and mountainous. Lodging: Tengchong has several hotels, but it is better to reserve in advance during the busy season. Standard rooms are 268 yuan but can be bargained down to about 90 yuan during the low season. Yunfeng Mountain is a Taoist mountain situated near the Myanmar border. Visitors have the option to reach the top either by hiking or taking a cable car. There are a number of small pagodas scattered around the mountain, but most people head for the main temple of Yunfeng Si located at the peak. At the mountain's summit, visitors are offered a panoramic view of the area. 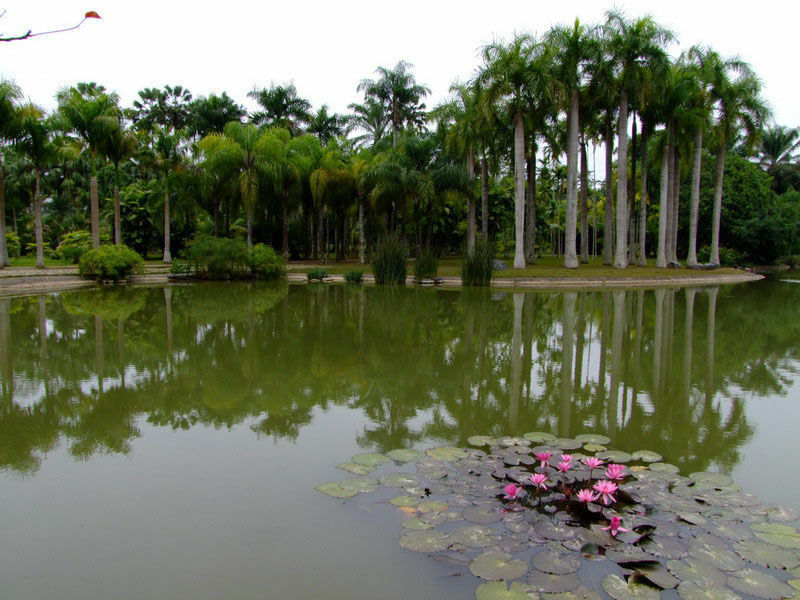 The Beihai swamp is a nationally protected wetland. The broad expanse of paddyfields, lakes, bamboo-made bridges and little boats sliding along the river create a quiet and peaceful scene. 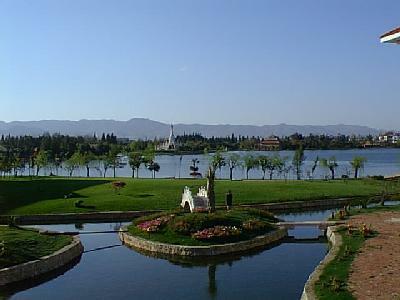 The lake surfaces are covered by a one-meter-thick grass flourishing with many wild flowers, but don't be deceived by the flat grass; the water beneath is about seven meters deep. Try boating and fishing on the river instead as a good way to relax. Transportation: The wetlands are 12 kilometers away from the county. A minibus costs five yuan per person. It is an approximately 20-minute long bus ride. Heshun Township is a well-known hometown for many overseas Chinese. The resulting hybrid culture makes it a great choice for visitors touring Tengchong. Transportation: Heshun is only four kilometers away from Tengchong. Hiring a taxi costs 10 yuan. Lodging: It is quite cheap to stay in Heshun; rooms cost about 10 to 20 yuan per night. The tomb of State Funeral lies one kilometer southwest of the county. It is the largest and best-preserved cemetery of KMT martyrs from the anti-Japanese and Second World War. In 1944, one of the fiercest battles of the eight-year long war took place here with the Chinese Expedition Force's counter offensive to retake Tengchong from the hands of the Japanese. Over 3,000 Chinese soldiers gave their lives in the 44-day long strike. Transportation: The tomb of State Funeral lies within the county; visitors can walk to the site. The nearest airport is in Baoshan, a two-hour bus ride from Tengchong. Visitors may take a flight from Kunming to Baoshan or take the 17-hour bus ride. Beginning April 28, 2005, travelers in Guangdong may also take a direct flight from Guangzhou to Baoshan. A taxi for a day that includes Yunfeng Mountain and the volcano park will cost around 250 yuan. Service to the hot springs will cost an additional 50 yuan. There are public buses to these sites, but they can become very time-consuming, as some walking or hitching will still be involved. Tour buses from the county to Rehai cost five yuan. Tengchong Hotel is a good deal. Standard rooms are 268 yuan but can be bargained down to about 90 yuan during the low season. Tengchong, tucked in a western corner of Yunnan Province, is 750 kilometers west of Kunming. Starting from Baoshan city and traveling along the China-India highway, built half a century ago, leads you to Tengchong Basin. Dozens of large and small volcanoes are interspersed with dense layers of trees. Located on the border of the Europe-Asia continental plate, Tengchong is a highly volcanic area. Since 1500, there have been over 70 earthquakes in the area measuring five or more on the Richter scale. The Daying (Beat Hawk) Mountain volcano has erupted many times. Ma'an Mountain consists of three volcanoes, some of which have formed lakes. Tengchong has the best preserved volcano groups from the Cenozoic Era in China. The history of Tengchong can be traced back to the Han Dynasty, around 100 BC. For 2000 years, it was an important station along the old southwestern silk route. Xu Xiake, a great Ming Dynasty traveler, described the place as the "number one furthest city on the border". The Han and 22 ethnic minority groups reside in the county. (For more knowledge about China's ethnic minorities, click here). The place is famed as "the cradle of Tengyue culture," a hybrid culture mixing Han Chinese, local ethnic minority groups, and foreign cultures from Burma. Tengchong was renowned as the Jadeware factory of China. The jade processing industry has been centered in Tengchong for over 500 years. Local people work jadeite into bracelets, earrings and many other decorations. In its golden days during the Ming and Qing dynasties, there were more than 500 jadeware workshops and over 3,000 craftsmen in Tengchong. The local Duanjia, Wangjia, Qiluo and Zhengkun jade works, named after their makers, are well known at home and abroad. Tengchong is also famous for producing traditional Chinese herbal medicines, Xuan paper (high quality paper for traditional Chinese painting) and rattan work which is exported throughout Southeast Asia. Tengchong, though a small city, has been an important link between southwest China, India and Myanmar since ancient times. It opened to foreign trade during the Qing dynasty and was even deemed important enough by the British to establish a Consulate there. The first consul arrived in 1899, and the office remained open until the 1940s. In the first decades of this century, the main route from Dali to Burma crossed Baoshan, continuing westward over the great Salween River before reaching Tengchong. The building of the Burma Road in the late 1930's shifted the route farther south, from Baoshan to Luxi (Mangshi) and on to Wanding, thus bypassing Tengchong. Today, the Burma Road remains the primary highway in western Yunnan .